NH Dusseldorf City Nord, renovated in 2017, is conveniently located in a triangle between the city center, the airport and the fairground in Derendorf/Dusseltal. While it is in a quiet residential area, guests can reach the bustling center of Dusseldorf in only 10 minutes. The S-Bahn Derendorf station is very close to the hotel, where you can catch a train to the central station and link to the airport. If you are driving, NH Dusseldorf City Nord provides easy access to the highway. The hotel features 330 rooms, finished with a sophisticated modern design. For your comfort, there are satellite TVs and tea and coffee-making facilities in each room. You may also stay connected with free Wi-Fi throughout the hotel. Connecting rooms are available, perfect for families and groups. In the morning, guests will love our breakfast, as it includes a variety of fresh dishes along with hot coffee and cold beverages. The NH Dusseldorf City Nord Restaurant is perfect for lunch and dinner with a great selection of German and Spanish dishes. If you would like to unwind in the evening, then enjoy a drink at the laid-back Quinto Bar. The hotel features a gym and sauna. 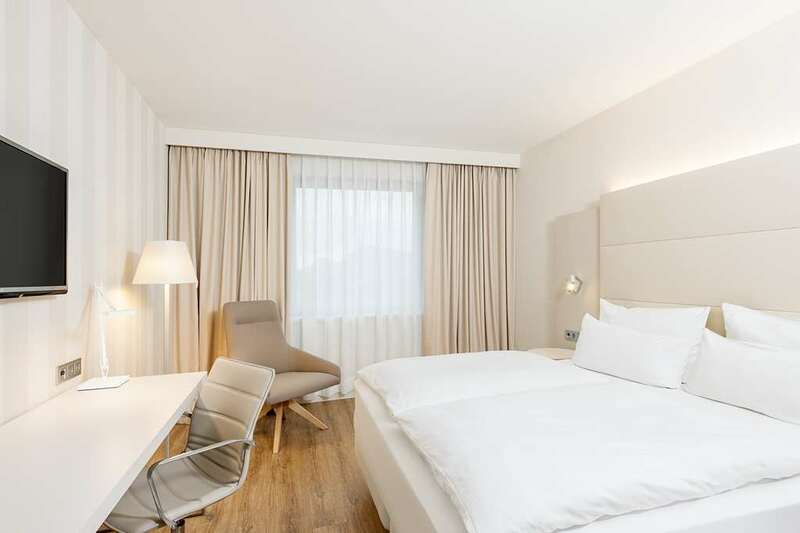 The 4-star NH Duesseldorf City Nord hotel is ideally located in the northern part of Duesseldorf, the NRW state capital, also widely known as a metropolis for trade fairs and fashion. The hotel is 10 minutes (2 train stops) from the Airport, 4 km from the trade fair center and is easy to reach by car. The A52 motorway is within 2 minutes. The NH Duesseldorf City Nord hotel is perfectly situated within the city, yet very quiet (equipped with soundproof windows). You will find cafes, restaurants and shops within short walking distance, or head to the city center with a 10 minute train ride.